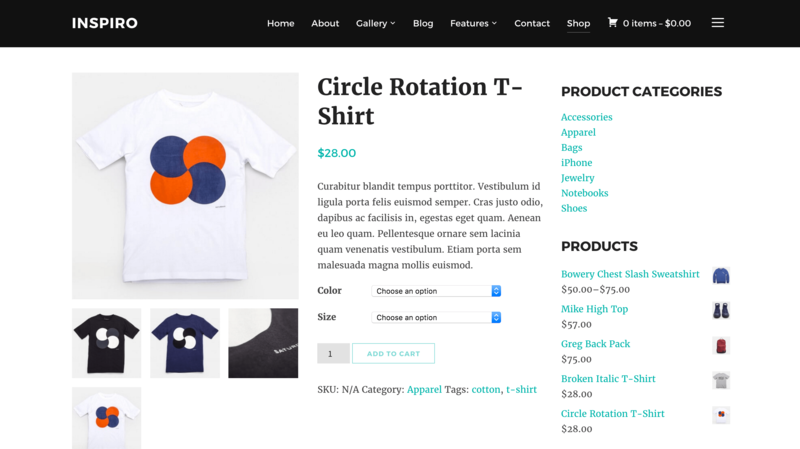 WooCommerce lets you sell products and services from your WordPress site. It’s a free WordPress plugin with additional features available as paid addons. WooCommerce is made by Automattic, the corporate arm of WordPress, so you’re in good hands. WooCommerce is the best option for selling products and services on your website. It’s by far the best designed and most popular eCommerce plugin for WordPress and is the most popular eCommerce solution across all websites. At the last count, WooCommerce powered 37% of all online stroes (source, select “The Entire Internet”). If you want to sell anything on your site, this is your best option. Installing WordPress is really easy. It offers a “famous five minute installation”, but you can be setup faster than that. You’ll need a website “host”, which is a company which provides space for your website to be stored. You’ll also need a “domain name”, which is the website address people visit to find your website (for example, wpzoom.com). You can buy these all at once for your convenience. We recommended three website hosts, which have differing price points to suit various needs. They all have one-click WordPress install, so choose the company best fitting what you’re after, setup your account and then follow the instructions for one-click WordPress installation! (P.S. If you’re totally new to WordPress, we’ve got a detailed video tutorial series giving you a full tour of WordPress). 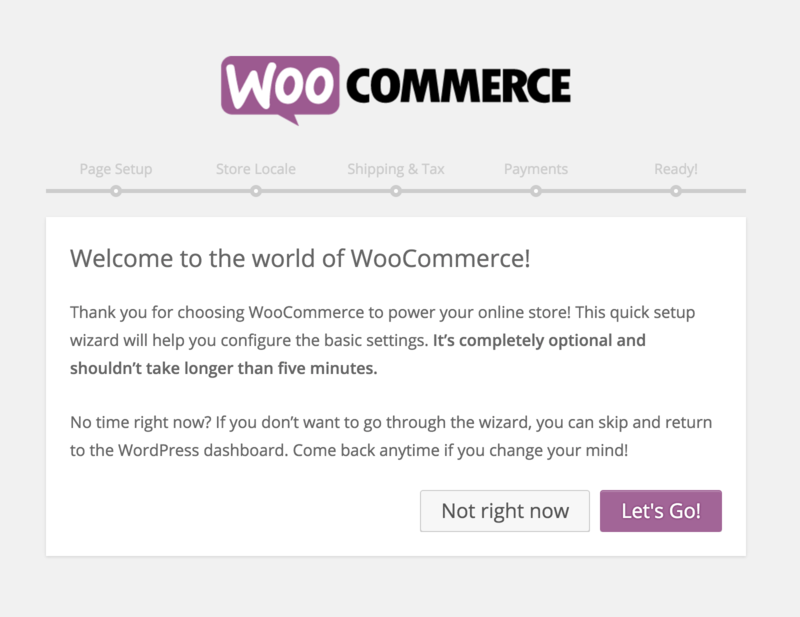 Once you’ve got WordPress installed, or if you already had WordPress setup, adding WooCommerce to your site is really easy. You can install WooCommerce straight from your WordPress installation, same as any other WordPress plugin. We’ve got a handy video tutorial on installing WordPress plugins if you’re unfamiliar with the process. Once you’ve installed and activated the plugin, you’ll be taken straight to an “onboarding” guide. This will take you through some of WooCommerce’s key settings. You’ll want to go through the guide straightaway and fill in all the details relevant for you. Once you’re done with the guide, head back to the main WordPress Dashboard. We’ll come back to getting your products, payments and extra settings added later on. You’ll see the plugin adds a bunch of options and extra menus to your site. We’ve got the basic setup done, so we’ll come back to these later on. The next step is the most important as it’s the thing your customers are going to be seeing – and they’re the ones making the purchases. Fortunately, WPZOOM has you covered. You can sell from your portfolio with Inspiro, offer business services with Diamond or sell from your blog with Monte. You can see our full library of WooCommerce compatible themes here. Other things to look out for are the product purchasing process, adding items to the cart and going through to pay (and how these all look). Choose your theme, install it on your site (skip to seven minutes in) and then we’re good to go with the more advanced WooCommerce setup! You’ll already have the core settings WooCommerce needs sorted from the initial onboarding guide. We’ll now cover some of the extra things you need to get your store up and running. If you need any extra clarity on any of these points, WooCommerce have some extremely in-depth videos for WooCommerce users. You can find these here. The first thing to do is add some products! These are the things you’ll be selling. 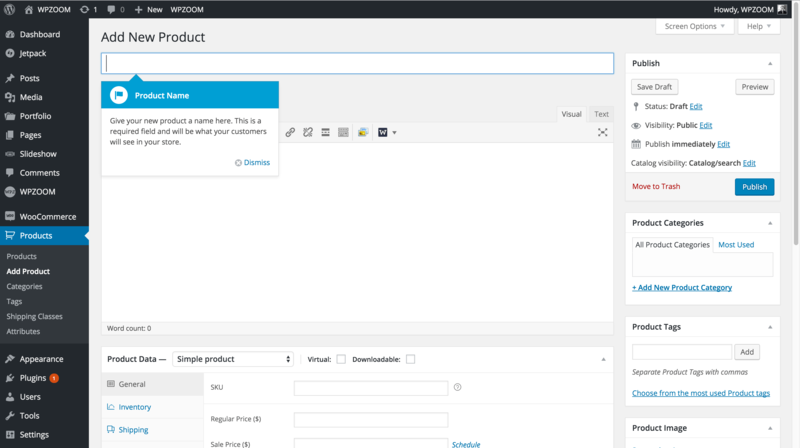 Under Products, click Add Product and you’ll be taken to the product page. It’s similar to adding posts or pages but specifically for WooCommerce products. You’ll want to add in all of the information there’s space for, including product name and description, product data and some nice accompanying images. 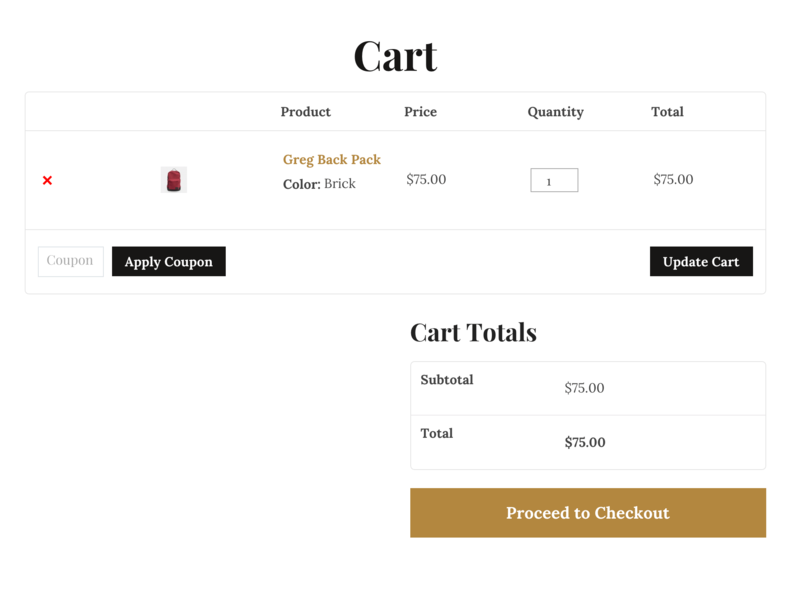 If it’s your first time adding a product, WooCommerce will provide some helpful prompts telling you a little about each section. Once you’ve added in all your information, hit publish and you have your first product available on your site! WooCommerce is hugely powerful out of the box, but sometimes you’ll have complex requirements for your site which the plugin can’t handle. In that case, you’ll want to choose from one of the huge selection of premium addons. You’ll find all of these here. There’s a lot to choose from, from additional payment providers, to complex shipping arrangements; accounting, inventory, marketing – it’s all there. You don’t need any paid addons to get started with WooCommerce, but they’re a great and easy way to add extra functionality later on. Starting to sell from your online store is easy! With this look at WooCommerce’s features and functionality, you’ve got everything you need to start today. Remember to make sure you get a beautiful WooCommerce theme and take it from there!